As you know, America’s Space Shuttle program came to an end when shuttle Atlantis returned to Kennedy Space Center on July 21, 2011. The event coincided with the 42nd anniversary of man’s first landing on the moon. (I remember watching the moon landing on our television from the living room floor in our house). I’ve always thought NASA should’ve had a program where they built a new shuttle every five years or so. Each new vehicle would be more technologically advanced than the last, possibly even with new propulsion systems by now. But that’s not what I wanted to talk about. On September 11, 2009, Space Shuttle Discovery, mission STS-128, was diverted to Edwards Air Force Base because of “unfavorable weather conditions” at Kennedy Space Center. It had been waved off a Florida attempt several times before NASA made the decision to try for the secondary landing site at Edwards. I was more than 100 miles away at the time. For the last two days I had been hoping that the shuttle would divert to California. That Friday was the best chance for me to see it. Normally, once NASA makes the decision to have the shuttle come down in California, the announcement is made maybe 2 or 3 hours, if that, before the landing. When I got word, I had to make a decision…fast! Remember, I was over 100 miles from Edwards. I’d be cutting it very close; too close. And I didn’t have my camera with me. The shuttle has landed at Edwards 54 times out of the 135 shuttle missions. They used to land here after every mission until NASA gained enough experience and confidence to have the vehicle land on the runways in Florida. (Of course, it was much more convenient landing in Florida because then they didn’t have to ferry the shuttle back across country on top of the 747). Looking back, it’s hard to believe that in the 30-year history of the program, I never got to see it come down. Oh, I tried a few times. Twice the shuttle landed before I got anywhere near the base. I heard the sonic boom from the car but that’s hardly any consolation. I’ve heard the booms from home maybe a dozen times or more, but had other commitments so I couldn’t make it out to the base. Once I made the decision to try to catch the landing, I prayed I wouldn’t run into any traffic. Thankfully, I didn’t. I got home and grabbed my Nikon D200. Let’s talk about that for a moment: Though I’d had the camera about two years by that time, I had never used a teleconverter with it. Fortunately, the camera was wearing a Nikon 80-400mm lens (anyone have a 200-400mm f2.8 they want to donate?) from the last air show I shot. But even that was not going to be enough. I considered taking a chance and bringing the teleconverter but, to me, the risk of using an unfamiliar setup and not getting any shots was too great: Would there be vignetting? Would the autofocus work (even though I recommend using manual focus when shooting aircraft [I guess that goes for spacecraft now, too])? How much light would I lose? Would I still get a sharp shot even with a slower shutter speed at these long focal lengths? All this ran through my mind, all the while knowing that whatever setup I went with, I was only going to get one shot at it. Leaving the teleconverter behind, I hit the road again with the D200, the 200-400mm and plenty of room on the memory card. Total time at the house was 4 minutes; I timed it. It had been trying to rain off and on all day. Clouds threatened to mess everything up by obscuring most of the sky. 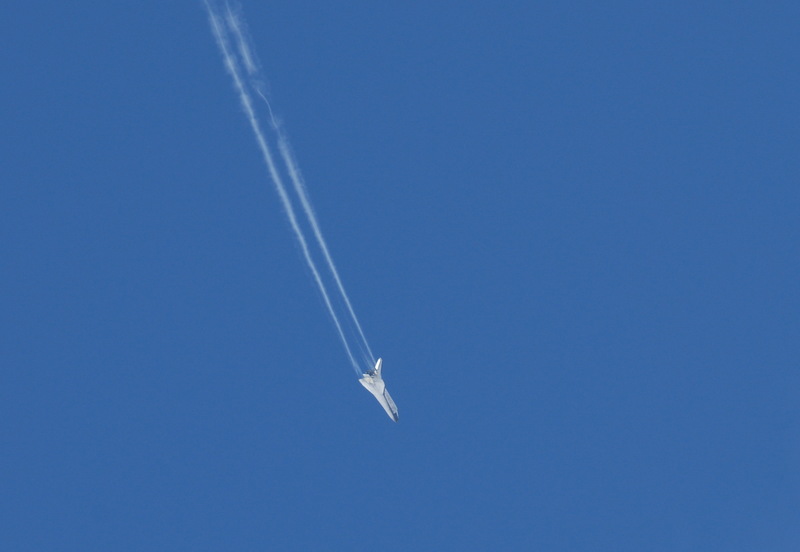 Somehow or other, clouds separated enough to leave behind large patches of sky for Discovery to dart through. Because the regular shuttle landing viewing site was closed to the public, spectators had to post up on Twenty Mule Team Road off Highway 58 near California City. I picked a spot on the east side of the street just up the rise from the off ramp. I picked that spot because it had a bit of altitude compared to the rest of the area, and no one would be in front of me. 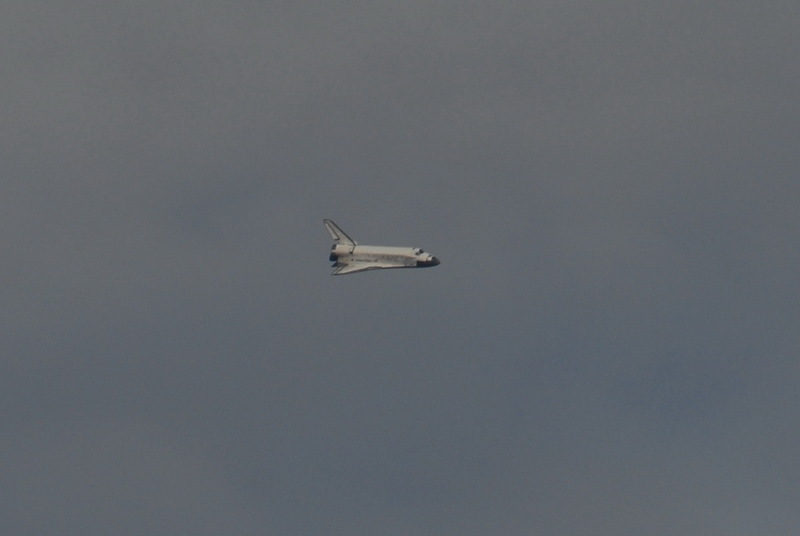 Also, when the shuttle passed by overhead, I could watch it make its turn and final approach to the runway. So there we were, maybe 50 or so of us. There’s always some sort of bond among aviation buffs and conversations struck up immediately. One guy had his laptop turned on. He tracked Discovery’s progress on the map in real time while a few of us looked on over his shoulder. A few minutes after the ‘announcer’ (or whatever you call the person doing commentary on the landing) informed us that Discovery had crossed the California coastline, we heard a sharp “crack-crack”; Discovery had announced her arrival with her signature double sonic boom. All heads snapped upward, searching for a small white dot coming out of the sky to the west. Then someone with binoculars spotted it. Discovery helped the rest of us out by leaving a contrail in the sky. The crowd went silent as cameras came to life. Everyone watched in awe as Discovery made a steep descent before leveling off. You could see the belly of the shuttle was still white hot from its fiery re-entry into the atmosphere but quickly cooled as it slowed down. She made a big, sweeping right turn and lined up with the runway at Edwards. A minute or so later, the landing gear dropped. We watched as long as we could until Discovery descended below the hill we were watching from. By then all we could see was her tail, rudder still split in airbrake configuration. I got off about 70 frames during the landing. It’s one thing to witness history, another to capture it on film – or in this case, electrons. It was a bittersweet moment. 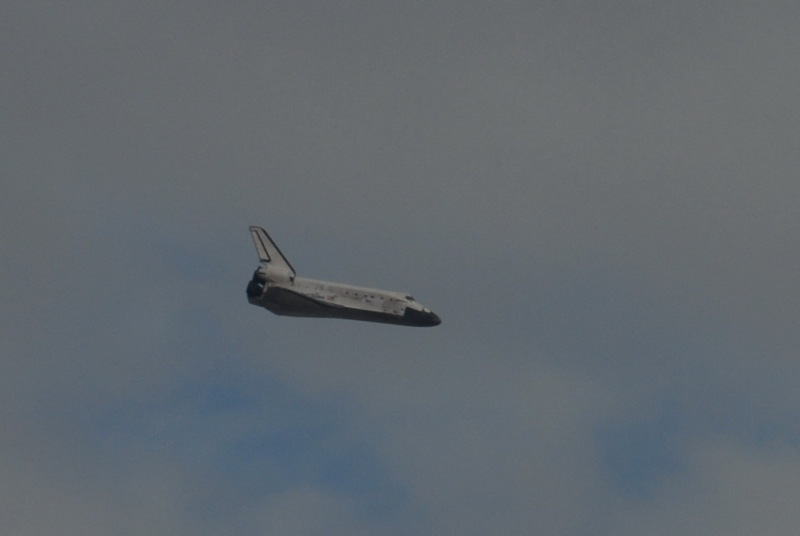 I was very glad I finally got to see the shuttle land, right in my backyard (almost). On the other hand, I was disappointed that, because we couldn’t get any closer, I wasn’t able to get the shots I had hoped to get. Good shots or not, my going proved to be an excellent (and historic) decision; turns out that day marked the last time any shuttle would ever land in California. My Smugmug page has some other Space Shuttle photos I have taken over the years. There’s a nice video of Discovery’s final landing at Edwards AFB where you can see it almost exactly as we witnessed it.